Two years after their previous work, French medieval black metallers Darkenhöld are back with their 3rd full-length album “Castellum“, released on September 15th 2014 via Those Opposed Records. Since its beginning the band has carved its personal style of epic melodic black metal, influenced by caverns, citadels, castles and medieval themes, something that you can easily guess just by looking at their cover artworks. After 2 split albums, Darkenhöld released their debut full-length “A Passage to the Towers” in 2010 and 2 years later their second work “Echoes from the Stone Keeper” was out, their first collaboration with Those Opposed Records. “Castellum” continues in a style close to their previous efforts, with improvements in sound and production, but most importantly, with much better songwriting, at least in my opinion. Darkenhöld have a very melodic sound, remaining always within the borders of black metal. This new album has a more epic approach, while a few tracks are closer to atmospheric black metal. They have a great sound, perfect for the genre, where everything sounds so clear and natural. The work in guitars in simply amazing, with wonderful epic melodic rhythmic riffs and leads, distinctive and powerful bass lines and really beautiful atmospheric acoustic guitars, which add bigger depth to their compositions. Their playing is clearly more technical now, something reflected in the drums too that have a very solid and natural sound. The band still uses synths, keeping them mostly in the background though, leaving more “space” to the guitars. Of course, there are parts where keys become more dominant, giving an epic cinematic and often bombastic feeling to the songs. Concerning the vocals, Cervantes sings with epic black metal screams, ideal for their music, sometimes more extreme and other times more melodic, accompanied by a few clean parts and epic background choirs. Darkenhöld use this time both French and English lyrics, changing languages inside each song! Like both its predecessors, “Castellum” contains exactly 10 songs and its total duration is around 43 minutes. And while there is a solid atmosphere in the album, the band doesn’t hesitate to experiment and add different elements in each song. This makes this work even more interesting, since every song has its own identity, something rare in the genre. For me “Castellum” is the best album of the band, with some really great songs. 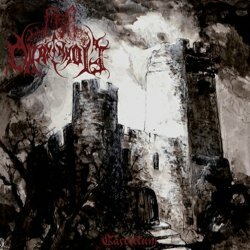 If you are into epic black metal and the dark atmosphere of medieval times fascinates you, then Darkenhöld is a great recommendation and ”Castellum” is the perfect album to start with. The album is released in jewel-case edition CD with 8-page booklet, including all the lyrics. The brilliant cover artwork is painted once again by Claudine Vrac, who was responsible for the artwork of both their previous albums. Her characteristic style gives a unique identity to their works, fitting also perfectly with the atmosphere of their music. You can visit their official pages below for more details and info on how to get their albums. You can also listen to their complete discography in their Bandcamp page. I definitely need to grab the albums from that band. Such a nice black metal outfit !